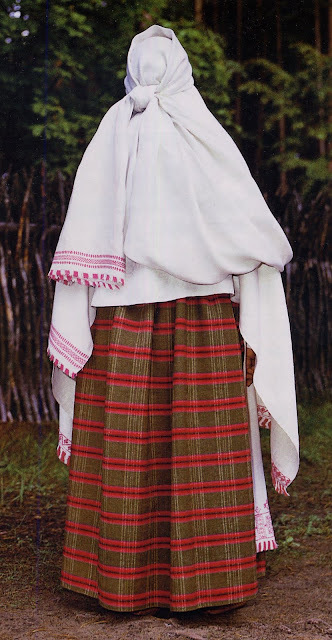 Today i am going to talk about a specific costume of southern Selonia. 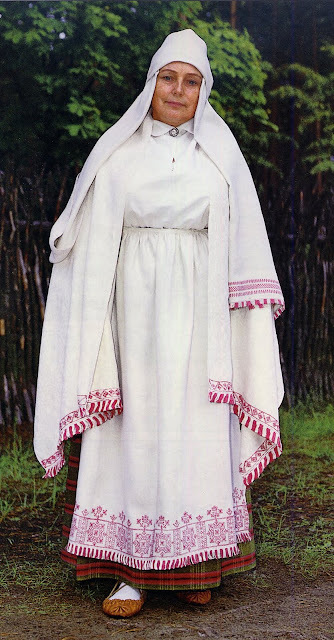 I already did one posting on Selonian costume from the north of Selonia. The costume i will describe today straddles the Latvian - Lithuanian border, being found in Nereta district, Augšzeme Province, Latvia. .For location see this link. And Biržai district, Aukštaitia Province, Lithuania. Check this link for location. 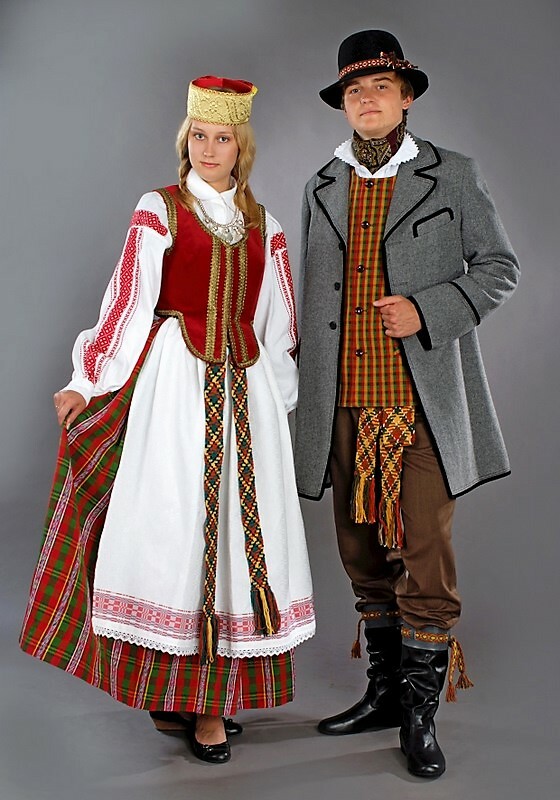 And here are a couple of examples of costumes from the Biržai district. A single girl. And a museum exhibit. These images are all from different sources so the quality varies quite a bit, i'm afraid. The distinctive piece of this costume is the chemise, which is typical neither of Latvian nor of Lithuanian Costume. 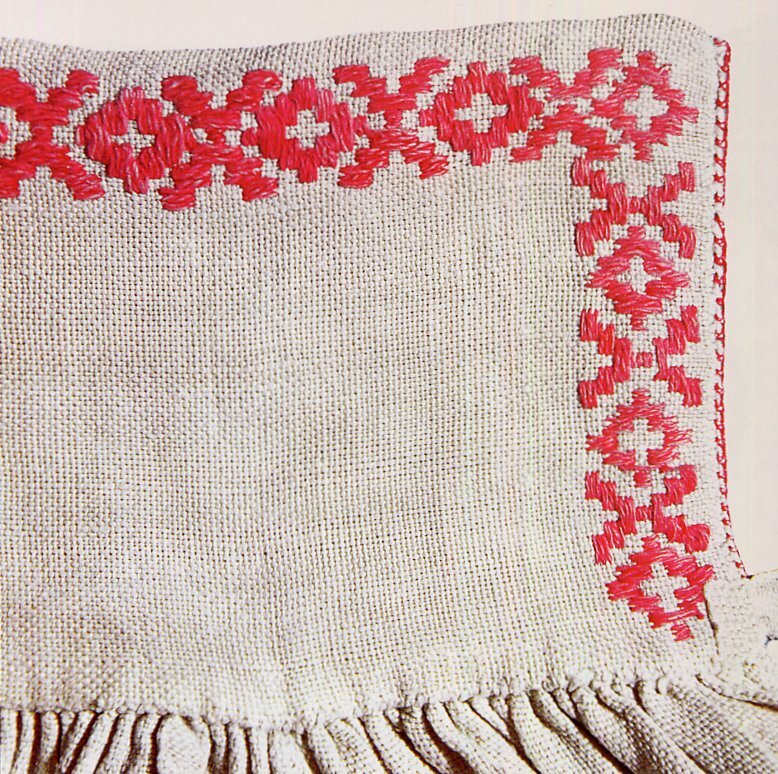 ﻿The chemise is made of two seperate fields for the front and back, and there are two wide inserts sewn onto the shoulders which contain horizontal woven ornament in red. 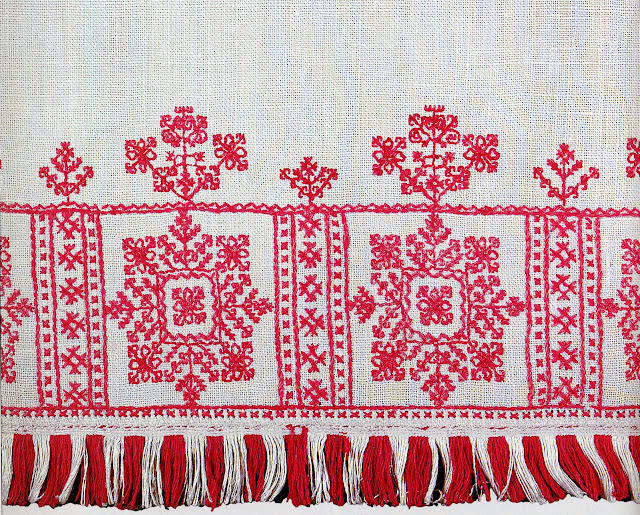 Both Latvian and Lithuanian chemises typically have a narrow bar over the shoulders with the front and back generally cut in one piece. The cut of this region is much more typical of Slavic costume, in fact if i had seen one of these chemises without knowing its provenance i would have identified it as being from Polissia, on the Ukrainian/Belorussian border. The second distinctive feature is red woven ornament placed vertically on the body of the sleeve. This feature is also not typical of either country. One could speculate that these features owe their existance to the old Selonian tribes. Here is the cut of the chemise of this region. Here are some closeups of chemises on the Latvian side. This is the shoulder insert and upper sleeve of one chemise. The collar of the same chemise. This is the shoulder piece and upper sleeve of another chemise. 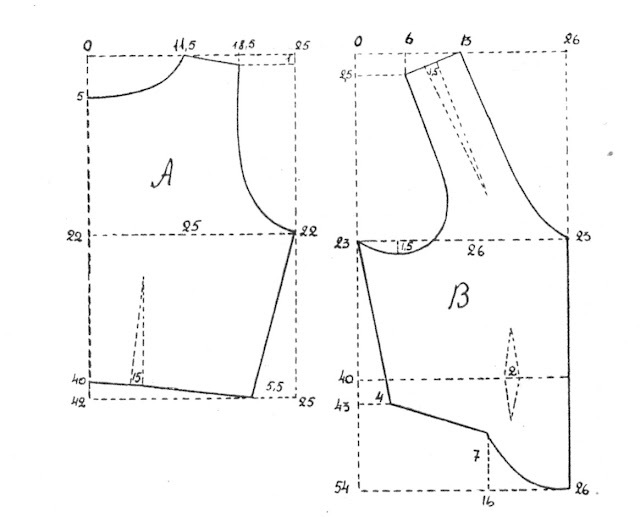 ﻿This is the shoulder piece of yet another chemise, the shoulder piece being attached with a decorative open stitching, the upper sleeve being at the right side of the image, and the body of the chemise at the bottom. The woven stripes would display horizontally on the upper arm. Here are two examples from the Lithuanian side. 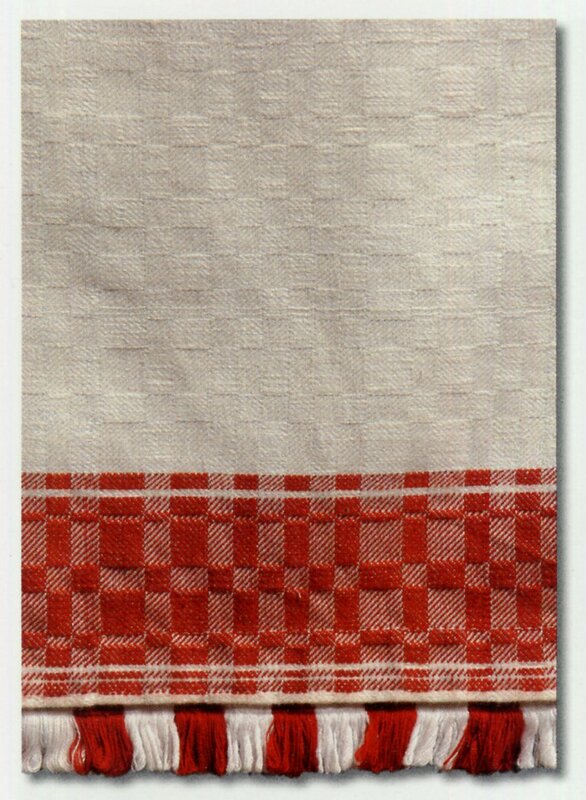 If you look at the images above, you will see that most show a plaid skirt, each woven in a different design based on red, green and other colors. 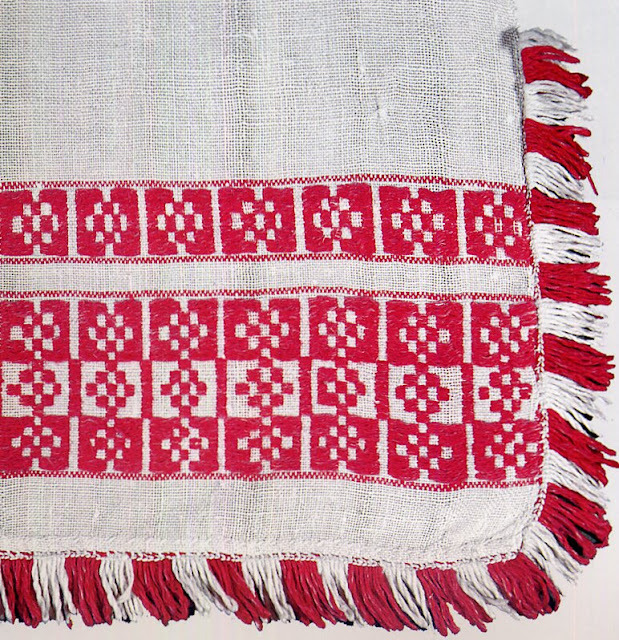 Another part of the costume is a sash, either inkle woven, or very commonly hand braided. 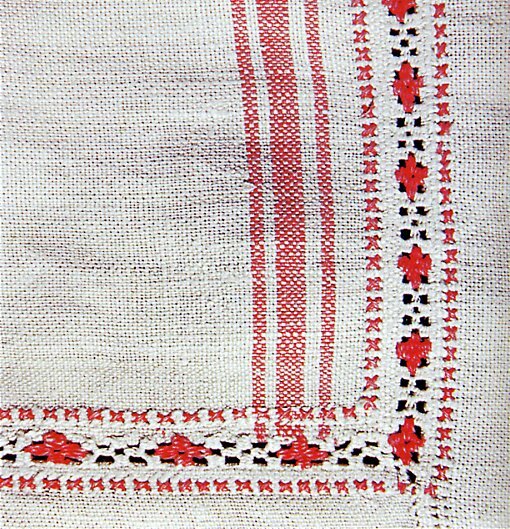 It also includes a linen apron, plain woven, or woven with a pattern, with red ornament at the hem, woven or embroidered or both. It may also be edged with bobbin lace or fringe. Here is a closeup of the apron shown in the first image. 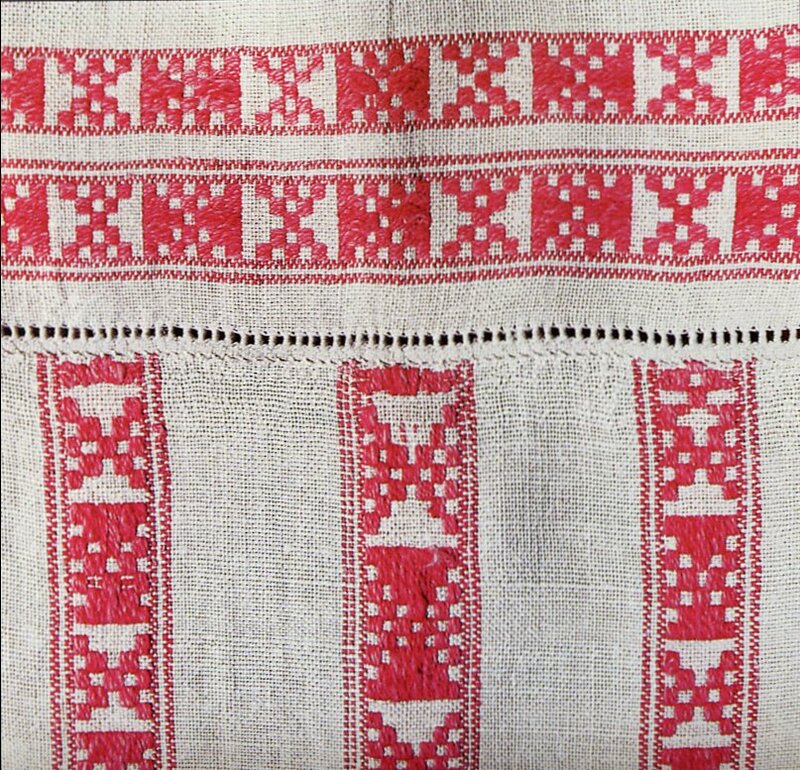 Here is a closeup of another apron from the Latvian side. 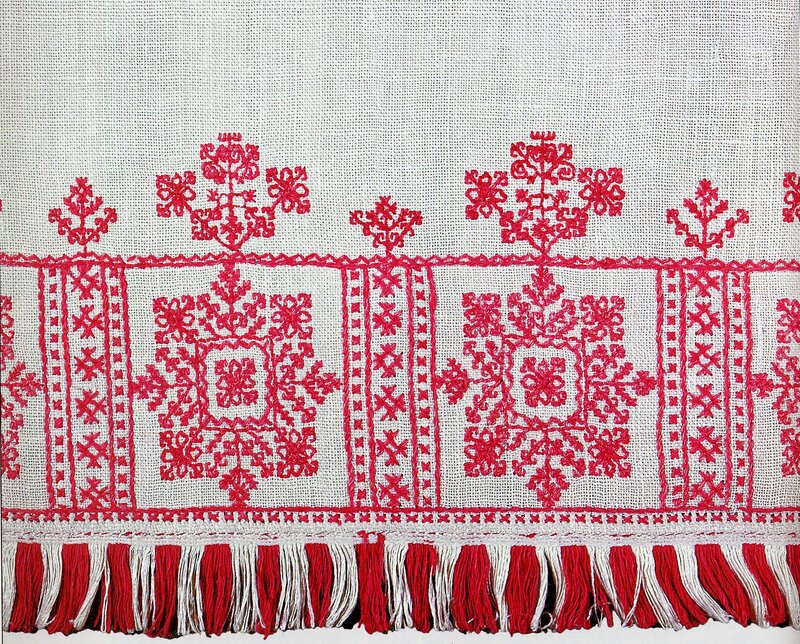 Here are closeups of two aprons from the Lithuanian side. You will recognize this apron from the three part image of the museum exhibit above. Both of these examples have a patten woven into the entire apron. 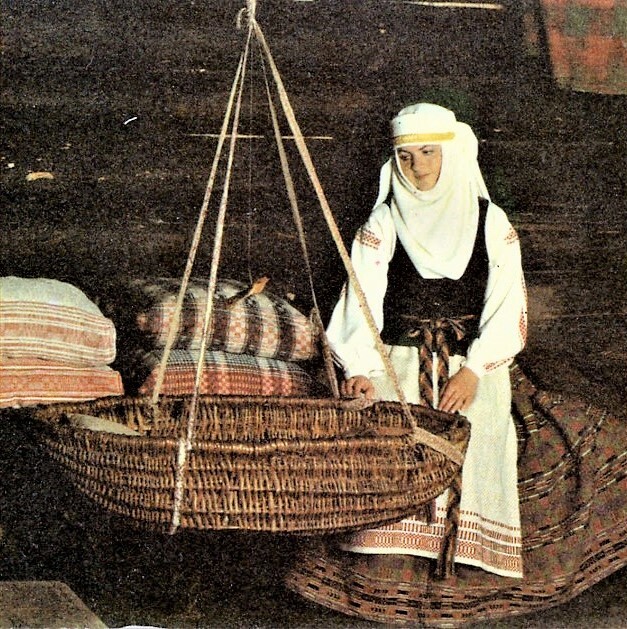 Two more linen components of this costume include the married woman's headcloth or 'wimple', called 'galvasauts' in Latvian and 'nuometas' in Lithuanian. 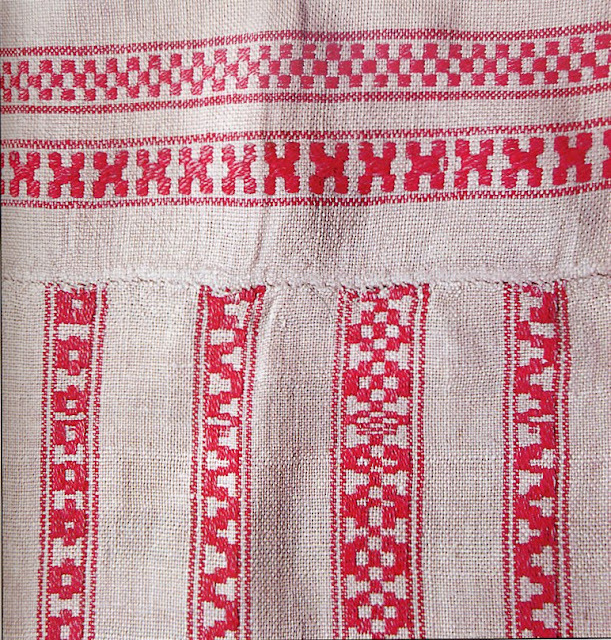 The ends were ornamented with similar designs as the chemise and the apron. Often the two ends had different designs. There are various ways of tying this garment, as you can see above. 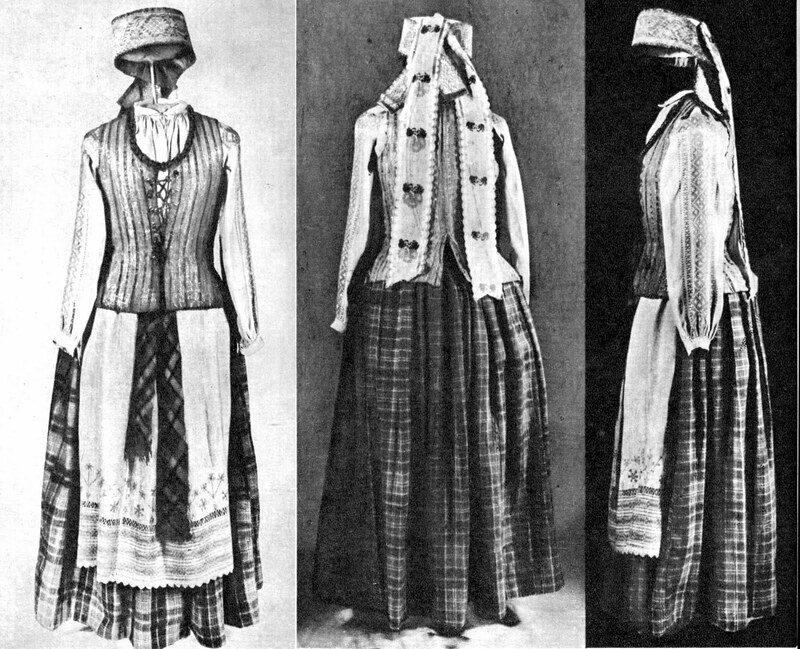 The last garment, visible in the first image, is the rectangular linen wrap, called 'snatene' in Latvian and in Lithuanian 'panuometis' if made of one panel and 'drobule' if made of two panels joined together lengthwise. These also had ends ornamented in the same way as the aprons and chemises. 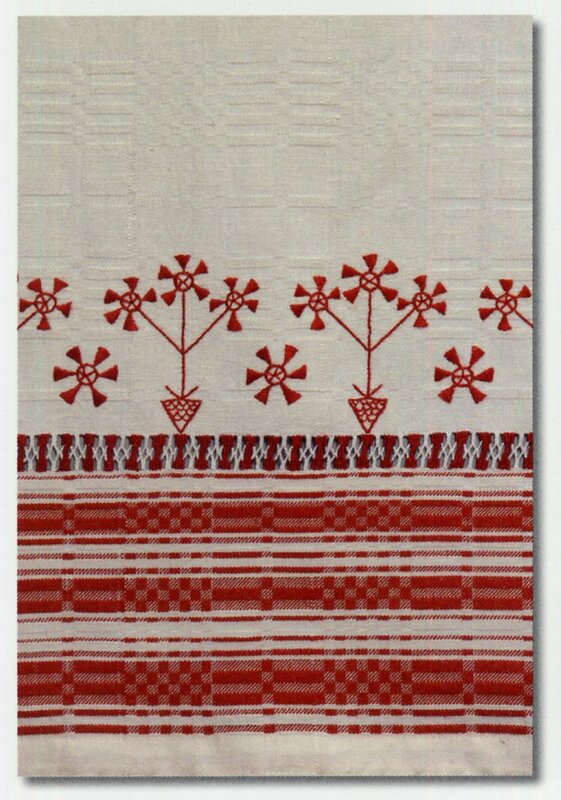 They were sometimes woven of linen and wool for cooler weather, but the elaborately decorated Villaine so typical of Latvia is found neither in this region, nor in the rest of Lithuania. If you examine the images above, you will see that the Lithuanian images show two different cuts to the bodice, or 'liemene'. 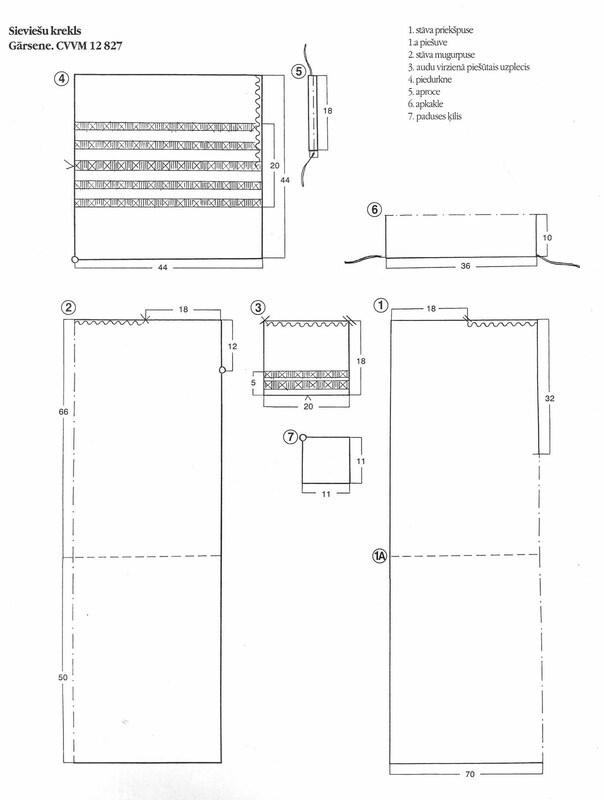 The last two images show a very basic cut, round neck opening, made of four pieces, sewn to the waist, and unjoined below, the bottom edges of the four pieces forming four lappets that extend to the hips. This is a common cut which is found all over Lithuania and Belarus. The first of the images shows a quite different cut, extending only to the waist in back but having two short extensions on the front. 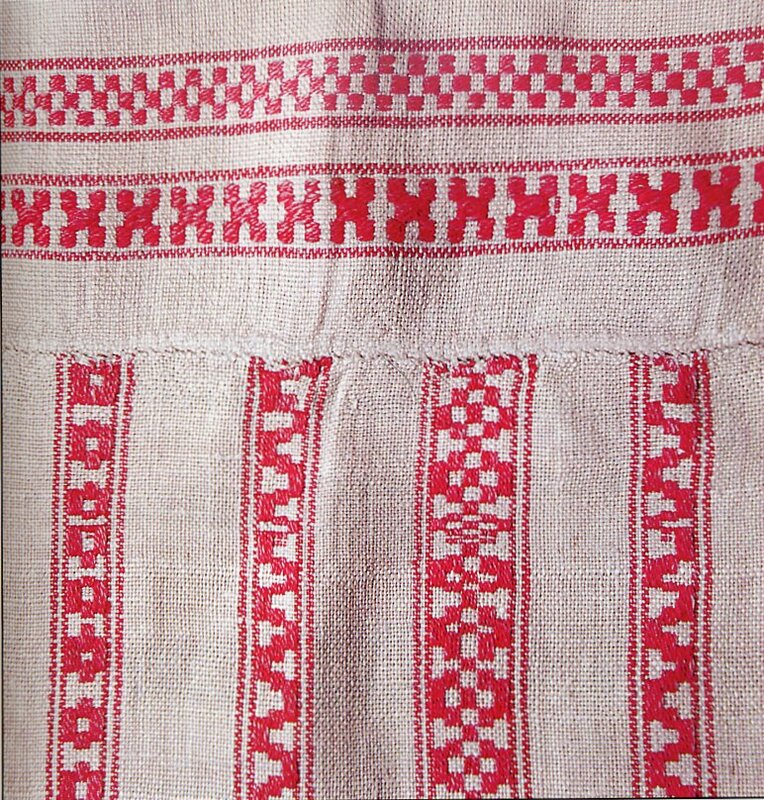 This cut is only found in western Aukštaitia, and in prints by Palaima and others, this is shown as the bodice typical of Aukštaitia. It was made of various materials, home woven as well as velvet or brocade. If the latter was the case, it was edged by metallic galoon. Either way it was fastened down the front with a chain laced through metal eyes or hooks. 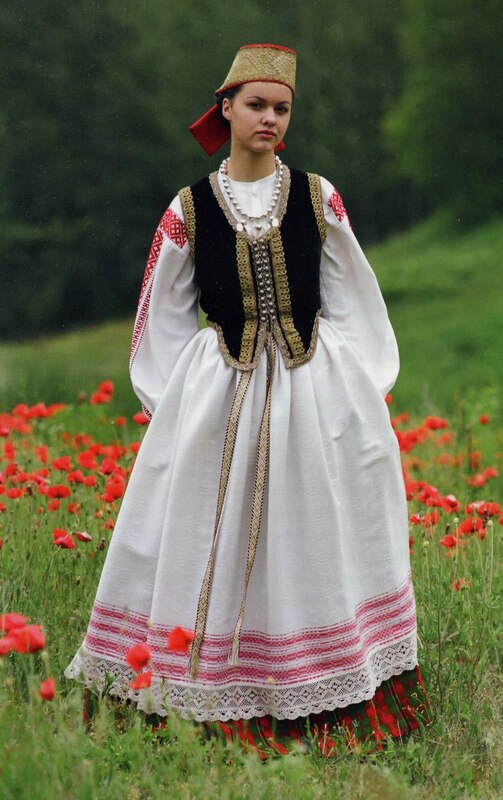 A couple images of this costume from the Lithuanian side. Note that this outfit has the horizontal ornament on the shoulder inset, but has horizontal ornament on the lower sleeve, instead of vertical. 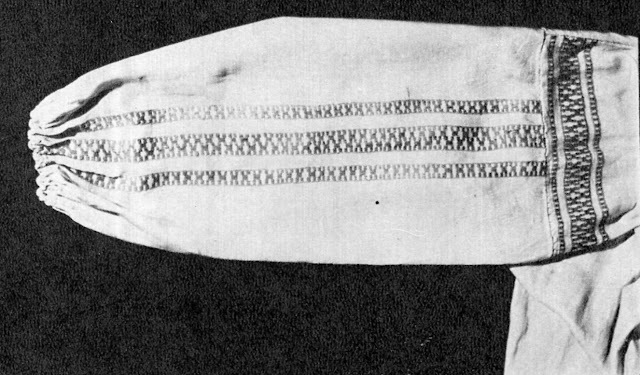 The various images show necklaces of glass or amber, typical of the entire Baltic region, but the girl wearing this bodice is also wearing a silver necklace of hollow beads and dangles, similar to those worn in neighboring Zemgale and by the Finnic peoples. These are also not found in other regions of Lithuania. 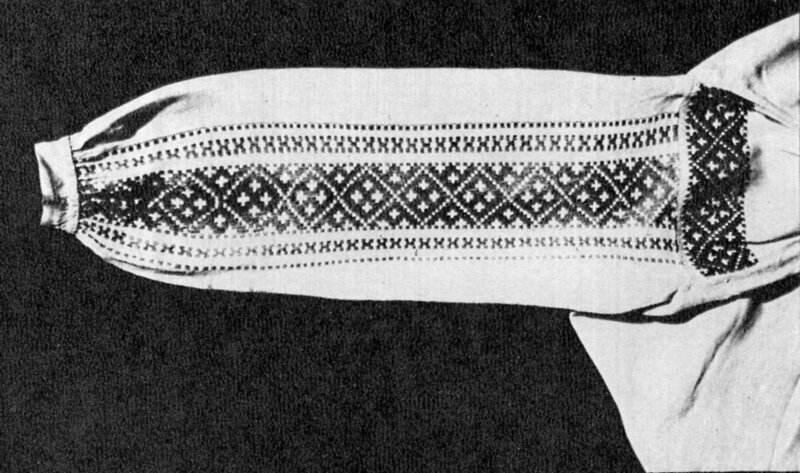 The 'karuna' or crown shown in two of the Lithuanian images above is made of a wide piece of commercially produced galoon, lined and fastened around the head, by itself in the first image, and combined with a bow made of a wide commercially produced ribbon in the second. The Latvian girl is photographed with a 'vainags' typical of eastern Latvia, with beaded decoration on red cloth. Thank you for reading, i hope you have found this interesting and perhaps inspiring. I intend to work my way through the various provinces of Lithuania unless i get a request to research another area first.